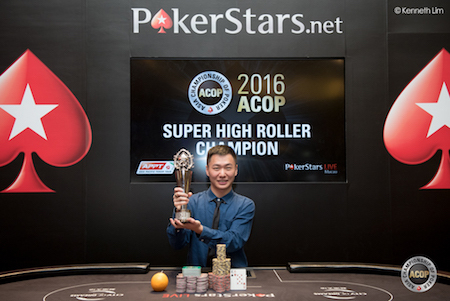 Chinese high-stakes cash game player Yuan Li has won the HKD$500,000 Super High Roller at the 2016 Asia Championship of Poker (ACOP) in Macau after making a heads-up deal with American pro Justin Bonomo. Li took HK$6,700,000 for first with Bonomo scooping HK$5,595,000. Li, British businessman Paul Newey, who ran his kings in to Li’s pocket aces, was third for HK$3,208,000. Li outlasted a field of 45 entries (33 plus12 rebuys) in the event. After his victory, the 27-year-old said: "I was very confident I could win the Super High RollerI am very aggressive, but not always. I can play tight as well. I will never give up, even I only have one big blind, I will keep going. I can control my emotions. I just try to make the best decisions." The HK$100k (USD $13,000) buy-in Main Event is now under way; Day 1a began yesterday with 105 entries. There's still time to get to Macau for the HK$250k High Roller which starts on Friday!